The University Scholars are pleased to welcome journalist, film-maker, and immigration activist Jose Antonio Vargas to Northeastern. Jose Antonio Vargas is a Pulitzer Prize-winning journalist, filmmaker, and the founder of Define American, a campaign that seeks to elevate the conversation around immigration. In June 2011, the New York Times Magazine published a groundbreaking essay he wrote in which he revealed and chronicled his life in America as an undocumented immigrant, stunning media and political circles and attracting international coverage. 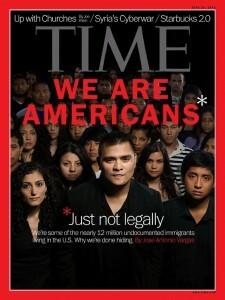 A year later, he appeared on the cover of TIME magazine worldwide with fellow undocumented immigrants as part of a follow-up cover story he wrote. Since then, he has testified at a Senate Judiciary Committee hearing on immigration reform, and written and directed Documented, a documentary film on his undocumented experience. As a writer for the Washington Post, Vargas shared a Pulitzer Prize for coverage of the Virginia Tech massacre. He received the 2014 Freedom to Write Award from PEN Center USA. Antonio Vargas's appearance is part of the Scholars Seminar on Leadership, Research, and Innovation, a semester-long series of events featuring thought leaders and change makers from both inside and outside the university. Other visiting speakers, to which all Northeastern students, faculty, and staff are invited, include Laverne Cox (January 26), Ta-Nehisi Coates (February 19), and Naomi Klein (April 16).